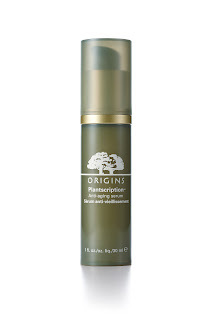 Origins have announced their latest product launch, Plantscription Anti-Aging Serum, which will be available from today, 3rd March. With over five years research and development behind it, Plantscription is designed as an alternative to the gold standard of anti-aging, retinoic acid (which has been associated with strong side effects). Jane Lauder, Global President and General Manager of Origins said, "Plantscription is one of the most significant product launches in the history of the Origins brand." whilst Lynn Mazzella, Senior Vice President, Origins Product Development explained, "This revolutionary, patent-pending, anti-aging serum is proven to help support skin's natural fibrillin, its critical elastic fibre and in doing so has trumped all of our benchmarks." Plantscription's key ingredient is extract of bark and leaves of the Ghanaian tree, Anogeissus, which has been shown as highly effective in supporting skin's regenerating processes. Working alongside Anogeissus, Rosemary Extract and extract of Siegesbeckia scrub (traditionally used in Chinese medicine) help to protect skin's natural collagen and elastin. I was sent a sneak preview and have been using the serum alongside my standard skincare regime for around 3 weeks. At £45, it doesn't come cheap but then it is aimed at the mature market (in clinical trials, it was tested on women aged 42-63) who are likely to be investing in skincare. Given the fact that results are noticable very quickly, I'd say the quality reflects the price.